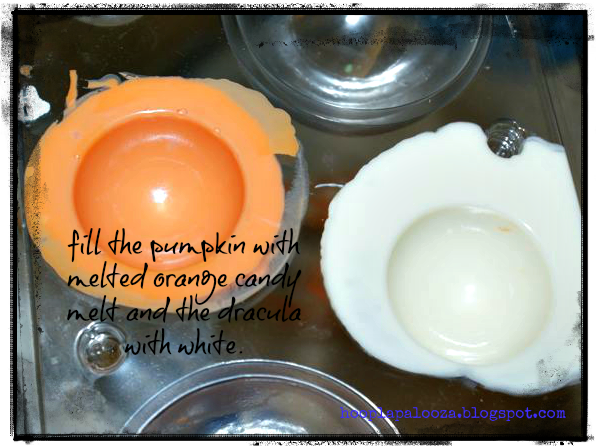 are you excited for another halloween treat? i hope so cuz i am crossing my fingers that you will like this. cuz if you make these cuties and share it with everyone you will all smile and have a glorious day! now that last line was really scary! as in really cheesy scary! 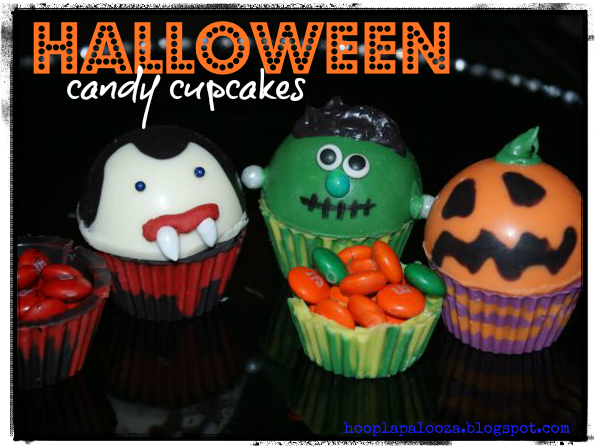 whad'ya say we make some of these not so scary cuties? i hope you'll stick around and not be scared to do this, since it may look complicated (cuz i am very visual and detail oriented). 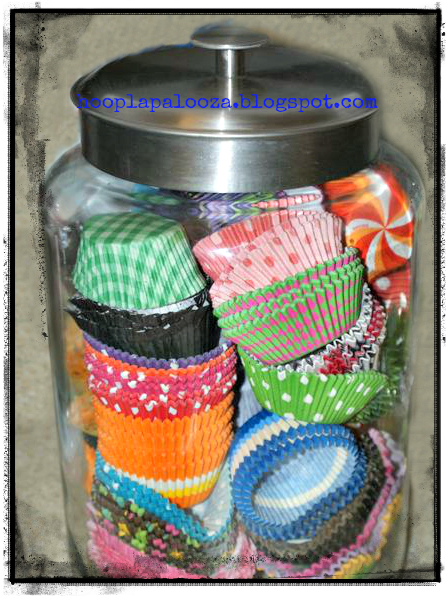 i first want to tell you i have an obsession for cupcake liners. yup. that's my jar of liners. and there are more in boxes and in my cupboards and in my closet and in my garage and in my shoe...HA! just kidding, wanted to see if you were paying attention. but honestly, i can't stop buying them. and what's even worse is that i never want to use them cuz i like looking at them so much so it just accumulates in my house. 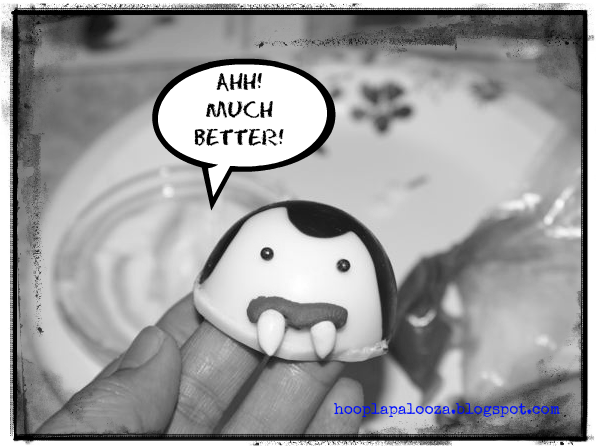 one day i think i will be attacked by the cupcake liner monster wanting all of them back. and my obsession is so bad that i decided to make my own! and this time out of candy! 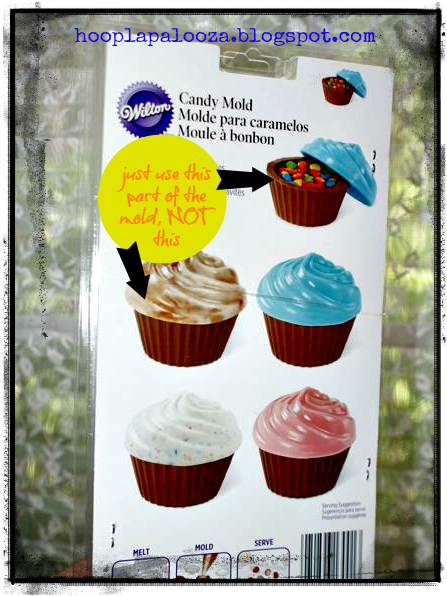 tell you what, let's make the WHOLE cupcake! 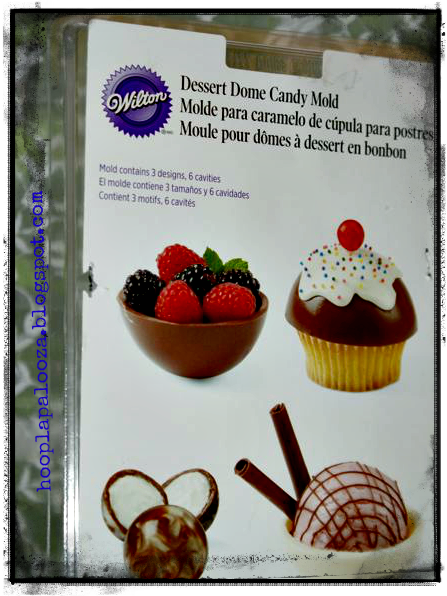 molds (shown below), candy melts, candy/sprinkles to embellish, & candy to fill cupcake. you'll have 3 liners to fill. 2. use a brush to paint the liner with the dark green candy. the idea here is to make the liner look like grass once it's done (this will make sense to you (hopefully!) once you read the entire post. 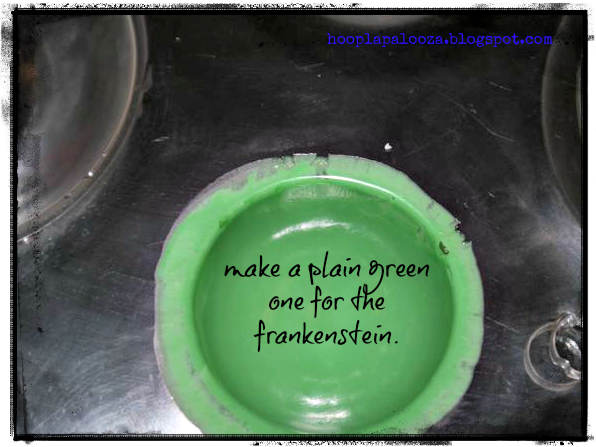 3. paint it here and there, leaving some spots for the light green to show. paint the bottom as well. 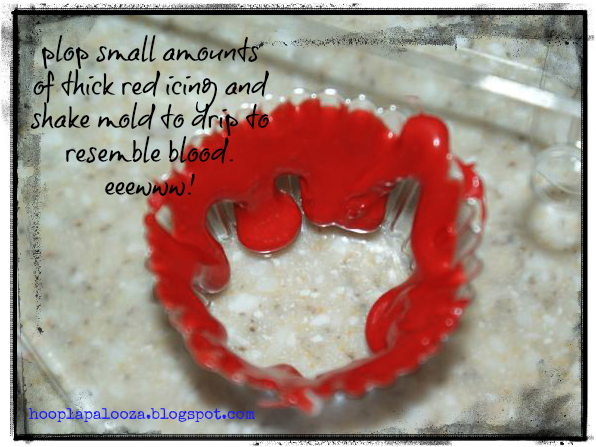 5. squish the top part of the mold and freeze. 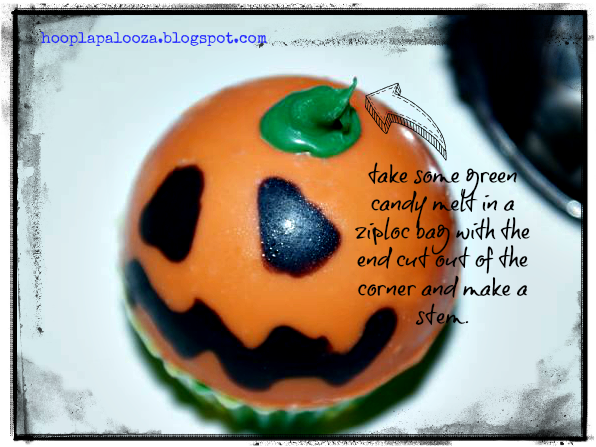 you can chip away the extra candy off the liner after it's set or carve it away with a paring knife.it's best to put extra candy melt than not enough or you'll have a heckuva time not breaking them if they are too thin. place the top part of the mold on top, squeeze the molds together and freeze about 15 minutes. 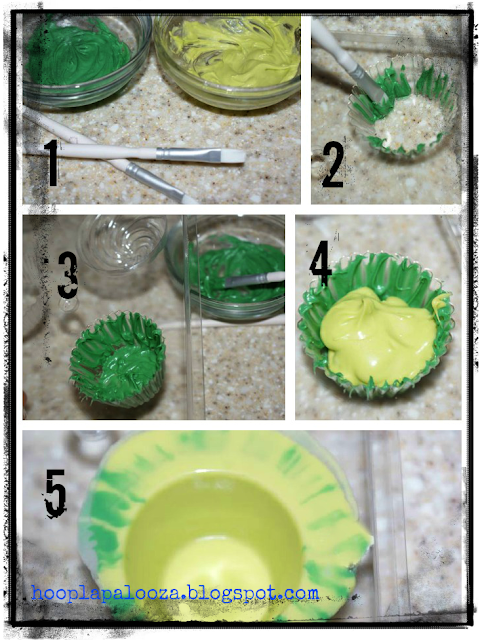 remove from mold and cut or chip away the excess on the cupcake rim, if any. now we got the liners made, put them aside and let's make the tops! use only the size of the mold that fits the liner mold. there are 2 spots to do so. 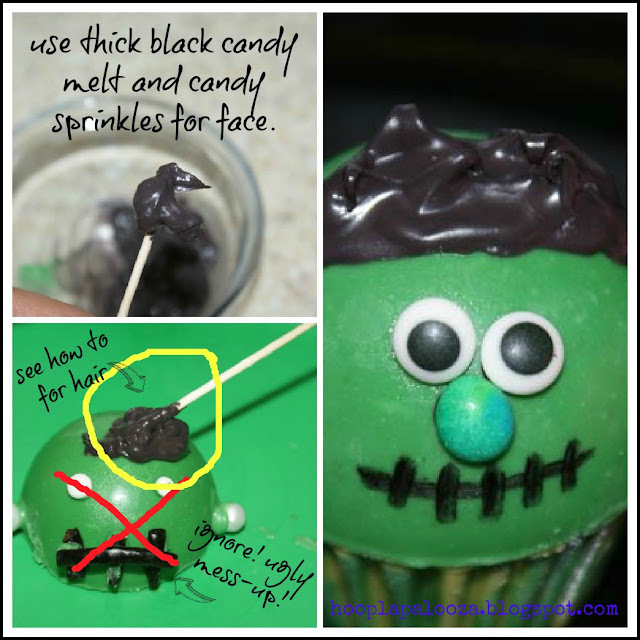 use melted red candy melt and 2 white sunflower seeds to make the mouth for the dracula. don't forget to add eyes. draw frank's mouth using a foodmarker. 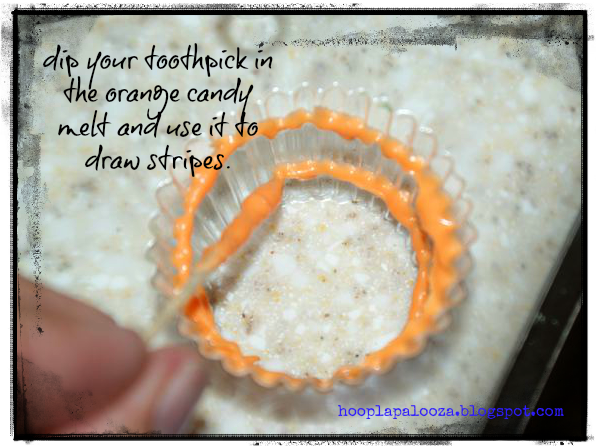 put some candy in the candy liners you made like m&m's and then put the candy tops on and admire. let's look at those liners a little closer again. i originally put jack on the grass liner but my son said frank should go on the green one to match better so, anyway, that's how that came about. i am finding it hard to eat these now. That is super cute! Love their little faces - would definitely have a hard time eating these. 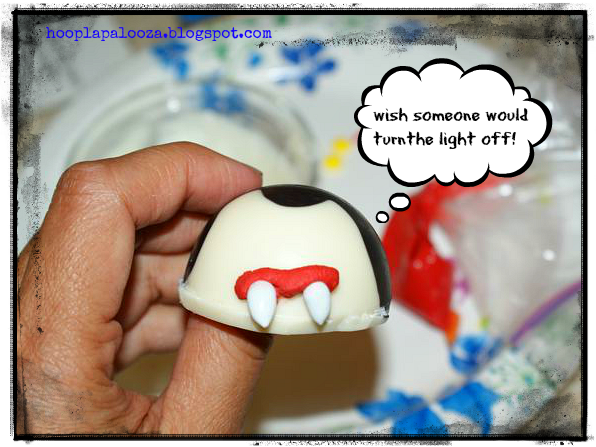 But what a great idea for a halloween party favor. Lisa! These are fantastic! I love them all. 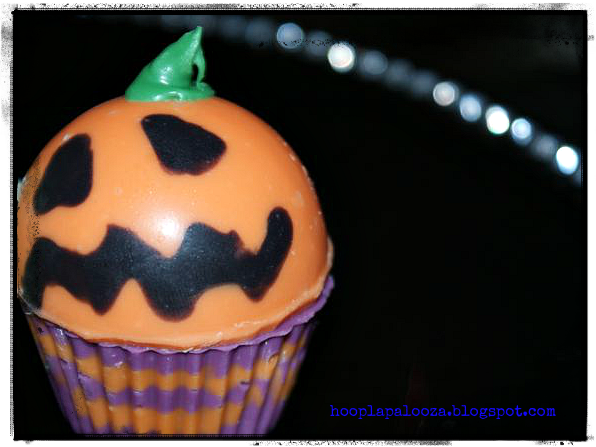 And- thank you very much for alerting me to the cuteness that is the simple cupcake liner. Somehow they had slipped below my collecting radar. After seeing your jar full o' cuteness I wanna make like a billion somethings with some of my own. (It seems I just thought I had made paper flowers out of everything.) :) Thanks so much for your delightful posts,my dear! LOVE! Amberly! 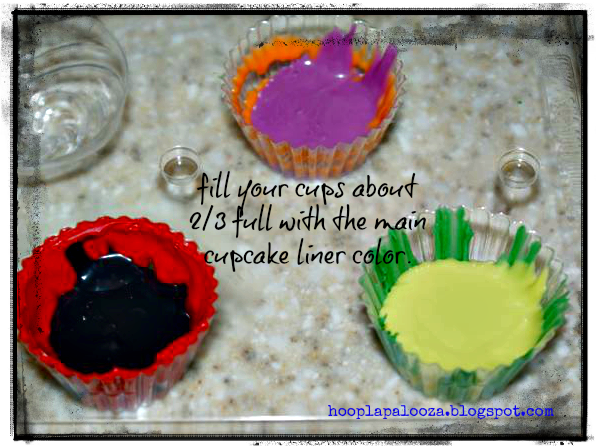 looks like you caught the cupcake liner disease! symptoms include heart palpitations with every new design, an empty wallet, and heart felt joy just staring at them. hehe i have no doubt your creations are gonna rock! wow great job! 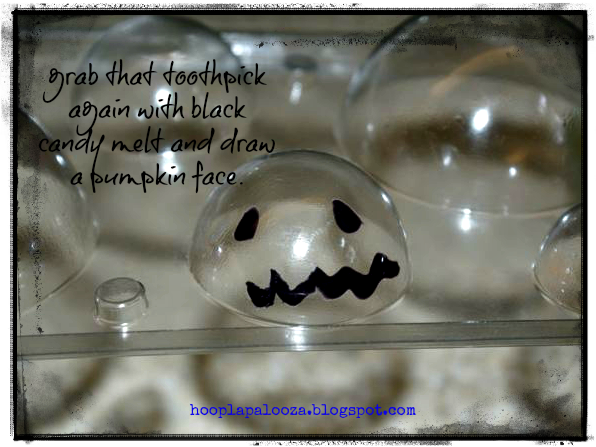 i have those molds and have been trying to think if ideas for them...thanks for sharing!!! These are great! 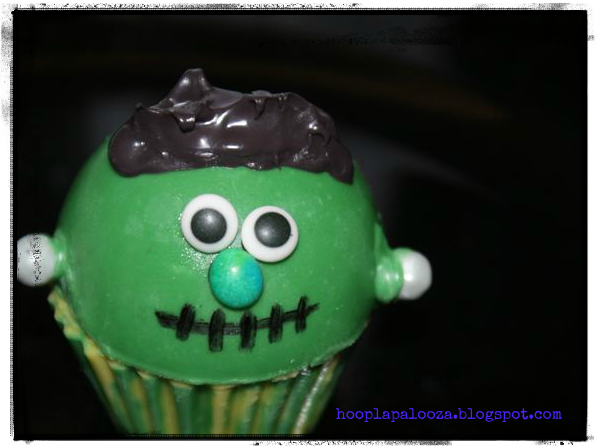 Spooky and yummy!!! I love these, they are really original - I've pinned them on Pinterest so other people can be inspired too. I've not seen molds like this before, will have to have a hunt to see if anywhere in the UK sells them. Thank you for posting on Saturday Show and Tell! I hope you'll be back this week with more! thank YOU MacKenzie and I will! 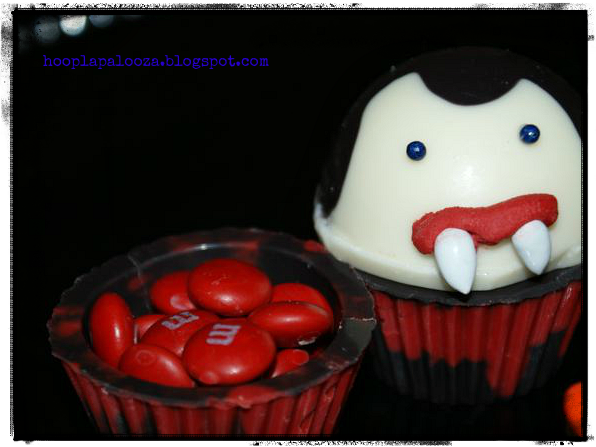 Really cute and very creative! Love them! Those are all just adorable! When I saw the first pic I just couldn't imagine how you had gotten the heads so perfectly rounded. 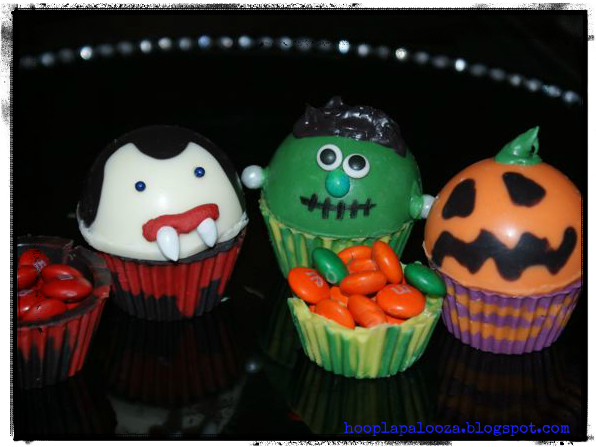 They look awesome, I think the Frankenstein cutie is my fave! 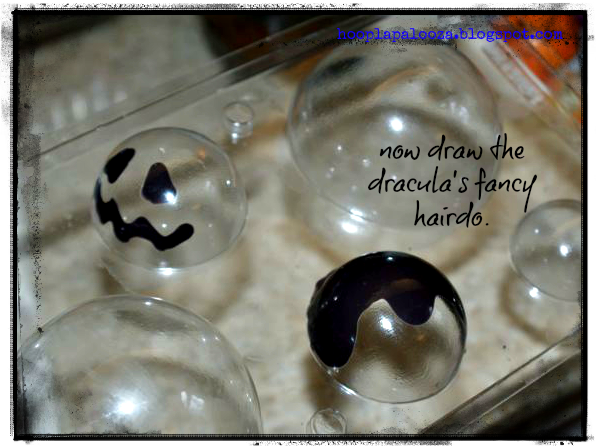 there are so many candy molds now Michelle-usually at 1.99 and you can do so much with them :) thanks so much again! Thank you for linking up at the Wildly Original party.